Whether you are faced with property damage due to a flood caused by inclement weather, a natural disaster, a leaking roof or a home water system malfunction, there are some best practices you’ll want to employ post-flood to ensure the safety of your property and family and to prepare you for the best possible outcome with your insurance company when you go to file a flood damage insurance claim. If your community has been flooded and your property or home has suffered flood damage, it is your responsibility to secure your property after a flood to prevent any additional damage from occurring. – EVACUATE when advised by authorities or if you are in a flood or flash flood prone area. Evacuation is the best action to protect yourself and your family. – CONTACT Stellar Public Adjusting Services immediately. – RETURN home only when authorities declare it to be safe. – WATCH out for debris when traveling home and be aware of areas where floodwaters have receded. Floodwaters often erode roads and walkways. – AVOID standing water as it may be electrically charged from downed power lines. – PROTECT yourself and wear waterproof boots and rubber gloves to remove water-damaged possessions and to avoid contaminants. – THOROUGHLY dry out the building’s interior for at least 30 minutes before re-entering. – PHOTOGRAPH the damage because your adjuster will need evidence of the damage and damaged items. – SEPARATE the damaged items from the undamaged items. – EXAMINE the property’s exterior for any visible structural damage, such as warping, loosened or cracked foundation elements to make sure the building is not in danger of collapsing. – KEEP watch for any animals that may have entered the building with the flood waters. – ENSURE specific policy information, like company and policy number, is available. – CREATE a list of damaged or lost items, including their age and value if possible. – MITIGATE mold and remove wet contents immediately. – ATTEMPT to drive through areas that are still flooded. – MAKE any contact with flood water, if at all possible. – KEEP main power on. – RETURN to the home until the authorities have instructed you to do so. – EAT any food that has come in contact with flood water. Property damage is our expertise! 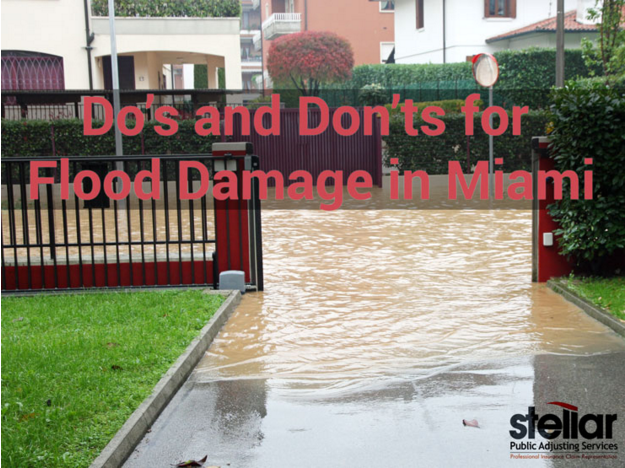 Anyone needing additional information, or if you are unsure if you need a public adjuster for your flood damage insurance claims in Miami, should call Stellar Public Adjusting Services at (305) 570-3519. Get a full understanding of your flood insurance coverage and the insurance claim filing process by contacting one of our expert public adjusters today!